Last January, my wife Evi and I accompanied John Caradimas, M1911.ORG founder and owner, at the SHOT show in Las Vegas. While visiting Hogue’s booth, Phil Spielberger, the company’s General Manager (Europe), was kind enough to give me a set of rubber wraparound grips for my ParaUSA P18.9 (model PX18.9S). After ‘living’ with them for several months, I am now confident that I can review them properly. But why review them in the first place? They are hardly new, after all. 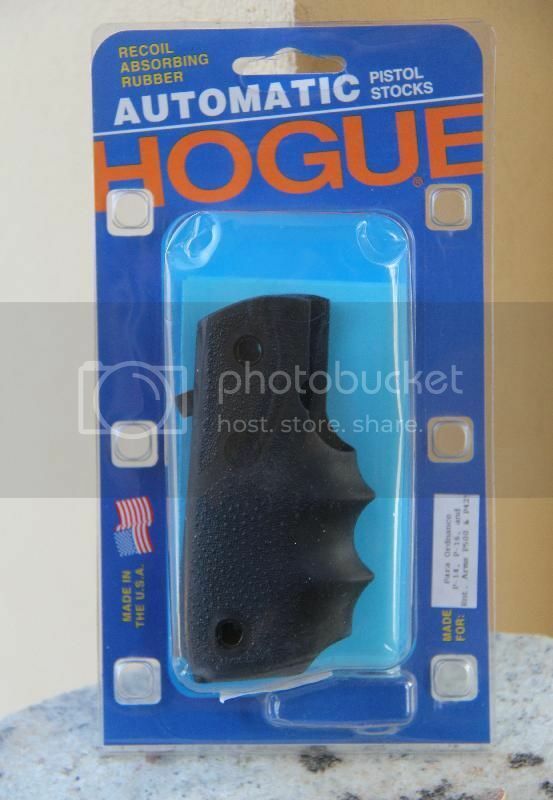 In fact, Hogue has been making this style of grips for a decade or two, for both singlestack and doublestack 1911s and a lot of other semi-automatics. Hogue is an Original Equipment Manufacturer for rubber grips and stocks found on many gunmakers’ products—semi-autos, revolvers and long-guns. 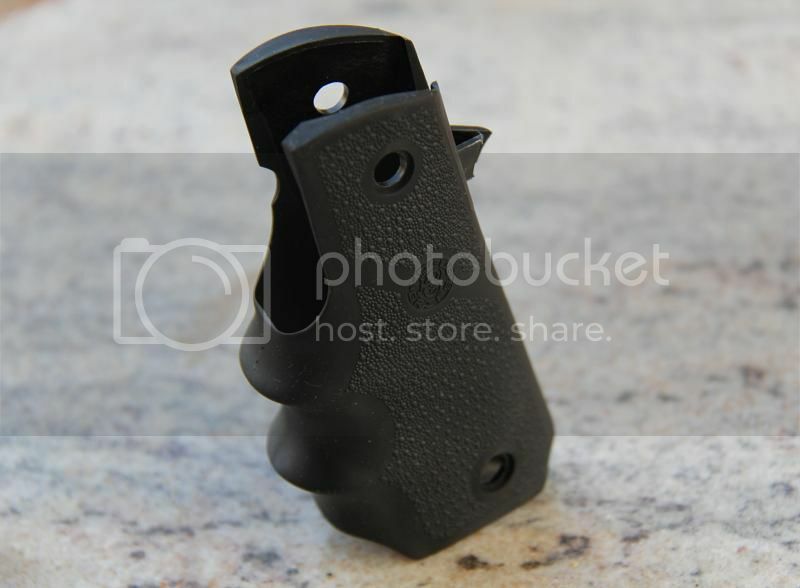 They also make the fixed-barrel Avenger conversion, for both singlestack and doublestack 1911 pistols. The reasoning behind this review comes from the scarcity of aftermarket grips for widebody 1911 pistols. 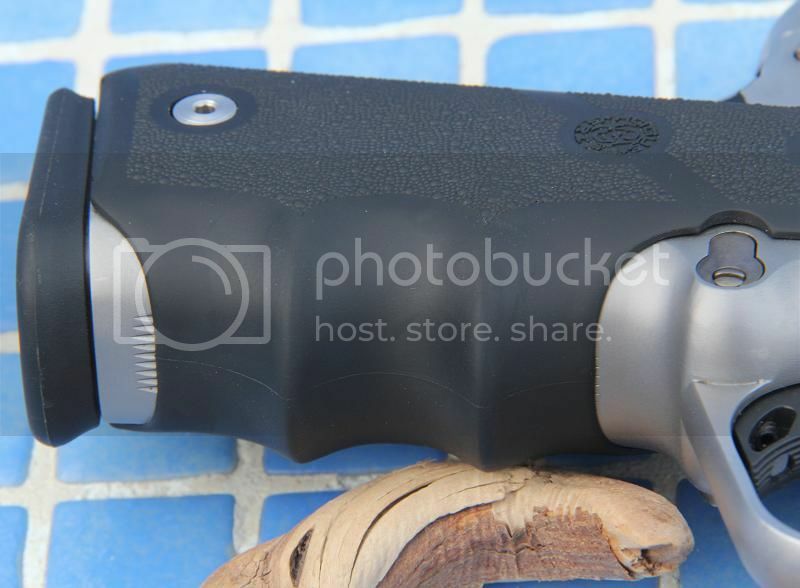 Owners of Para, Springfield, Armscor and other doublestack 1911 models have nothing like the variety of aftermarket grips available to ‘regular’ 1911 owners. The reasons for this disparity are twofold. First, the grips have to follow the complicated metal surface contours of these pistols’ grip frames. Second, they need to be very thin. Making them out of wood, while maintaining the original thickness, is not easy. It can be done, but only a handful of grip makers try to do it. Other materials are a different story. The E-zine already features a review of some offerings from Alumagrips, including a set for Para widebodies. The grips are packaged as shown. A short and simple set of instructions is included. The model sticker reads: ‘Para Ordnance P-14, P-16, and Ent. Arms P500 & P425.’ It seems that the designation dates back prior to Para’s first P18.9 (and well before they changed name to ParaUSA), the ‘PXT’ version of which you see here. I do not know how many readers recall the replacement frames offered by Enterprise Arms at one time, but they were indeed strikingly similar to Para’s and used the same magazines. 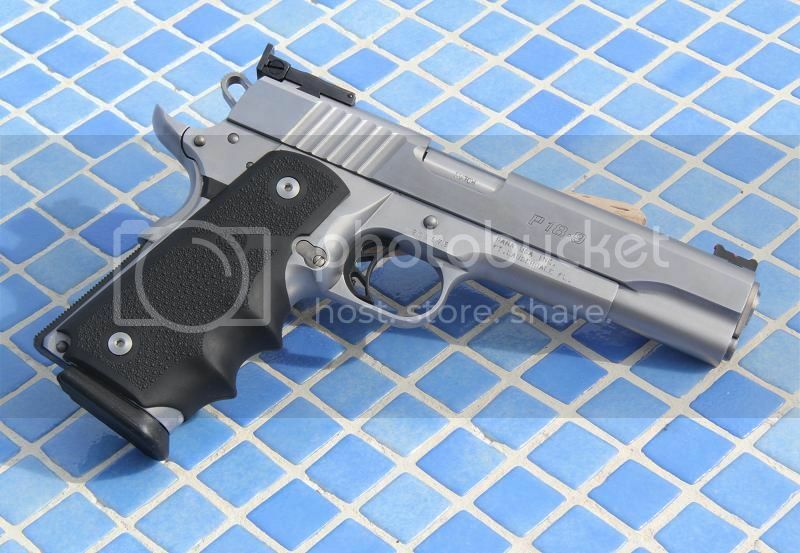 In the M1911.ORG forum, we have seen these grips fitted on Armscor-made widebody 1911s, but some modification may be required. It is worth noting that in the front-strap section, the space under the finger knuckles is solid rubber (see below). Other wraparound grips have voids under the ‘knuckles’, which can deform, thus offering a less solid feel. Not so with the grips you see here. The inner surface may seem slightly uneven, but this is of no consequence once the grips are fitted. The flat inside frontstrap surface. As soon as I tightened the last grip screw, I knew I would like these grips. Yes, there are better-looking materials that you can make grips from. Not a problem, as I never expected to be ‘wowed’ by the appearance of rubber panels. 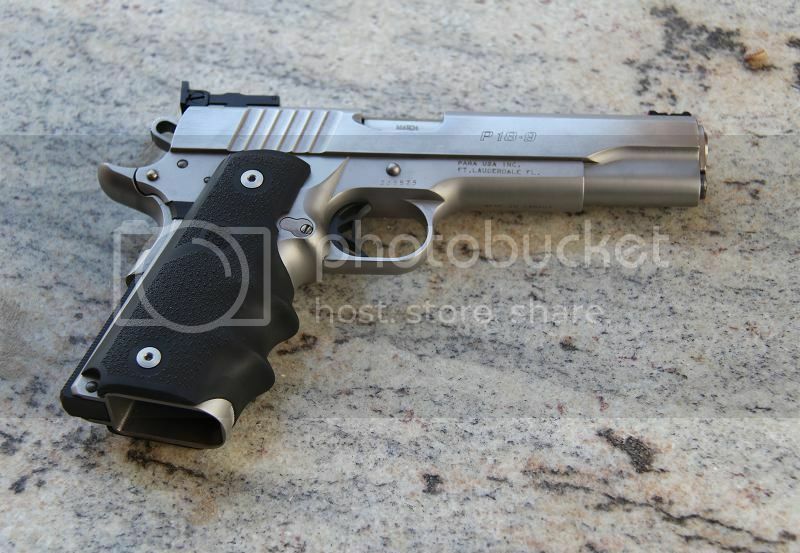 But these grips fit the uneven contours of the pistol so well that they take a 'business-like,' OEM appearance. The bare grip frame reveals the cut that allows the wider trigger bow to go through it. To allow the installation and removal of the wider trigger bow, widebody 1911 frames need to have an appropriate cut in the frame—and the means to hide this cut. Modular STI frames solve the problem by having metal and plastic meet at the appropriate location, so no visible cut is needed. Caspian, BUL and others use a specially-profiled grip safety, with ‘ears’ protruding at the sides of the safety. Being the first to make a doublestack 1911, Para simply uses a small tab on each grip panel, which extends to the rear and covers the gap. Note the right-side 'ear' covering the trigger bow gap. 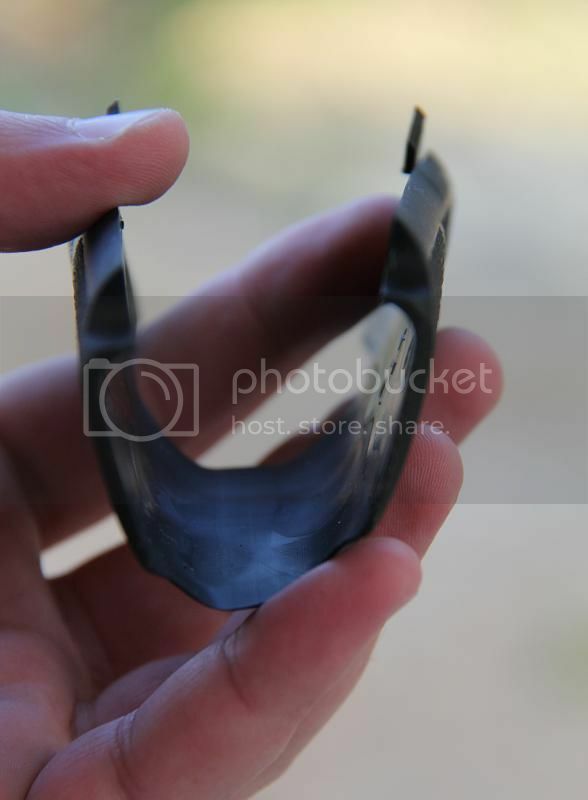 Making the grips out of rubber means that the material has to be stiff enough so that the thin tabs can do their job. I am happy to report that they do. Fitting the grips required a small amount of stretching, obviously to ensure that there is no gap under the frontstrap. The grips need to be stretched with some finger pressure in order to line up the grip screw holes, at which point the two tabs in the rear simply ‘click’ into place. The left-hand tab is quite close to the thumb safety lever but does not interfere with it. Owners of LDA Paras can simply cut these tabs off, since these pistols have a pivoting trigger and therefore, no trigger bow. The left-hand panel hugs the plunger tube as it should. The right-side panel is not cut for an ambidextrous thumb safety. However, there is a marked section under the panel that the owner can use as a guide to cut it (carefully), allowing ambi safeties that rely on the right grip panel to hold the right paddle in place. 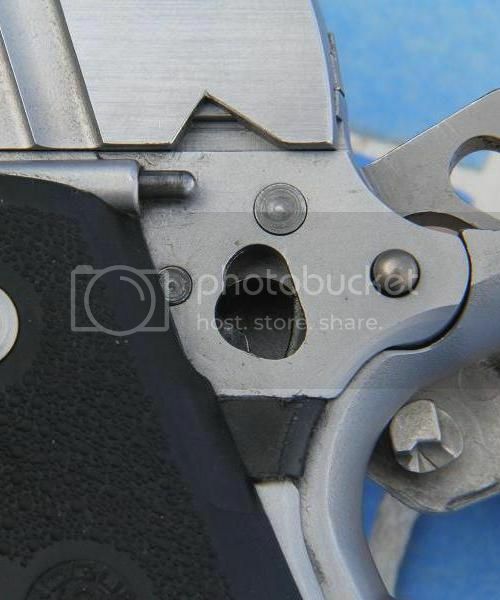 As I have no such safety on my pistol, I appreciate not having a visible gap on the panel for a part that I do not use, but I suppose that ambi users might see things differently. Shooting the pistol with these grips is very pleasant, but this is hardly surprising—after all, this is a full-size, all-steel, 9mm 1911. 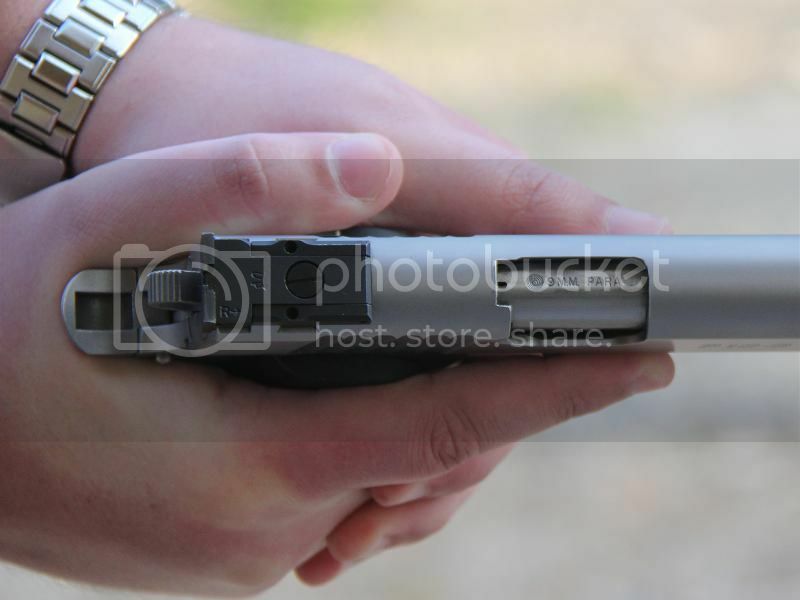 What is particularly good about them at the practical range is that during a quick draw, the finger grooves provide excellent feedback about the shooter’s grip. This is probably of little interest to well-practiced shooters, and perhaps one day I will be experienced enough to have no use for finger grooves. But for now, I really like them. A rushed and fumbled draw cannot keep me from knowing what my grip is like, even before the gun clears the holster. Some people object to wrap-around stocks because they increase the girth of the grip. This is a reasonable point: with material being added on top of a previously bare front strap, there is simply no way around this. It is up to you to decide if the end result is an improvement, or not. The full-size Para frame is big enough as it is but, in my hands, these grips are a big plus at the range. Note the relation of the index finger and the slide stop crosspin in this picture, with a two-thumbs-forward hold. Many people assume that Para widebodies are wider than single-stacks. This is only marginally true. The word ‘girth’ describes the change from the singlestack to the doublestack much more accurately, since the maximum width of the grips differs only slightly. 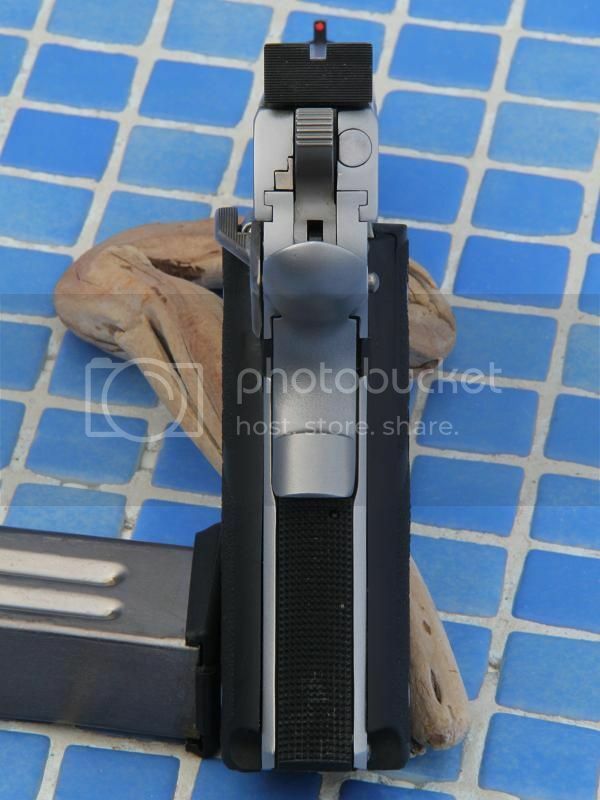 In the picture above, note that my index finger's first joint is resting just short of the slide stop's crosspin—same as with the factory grips. 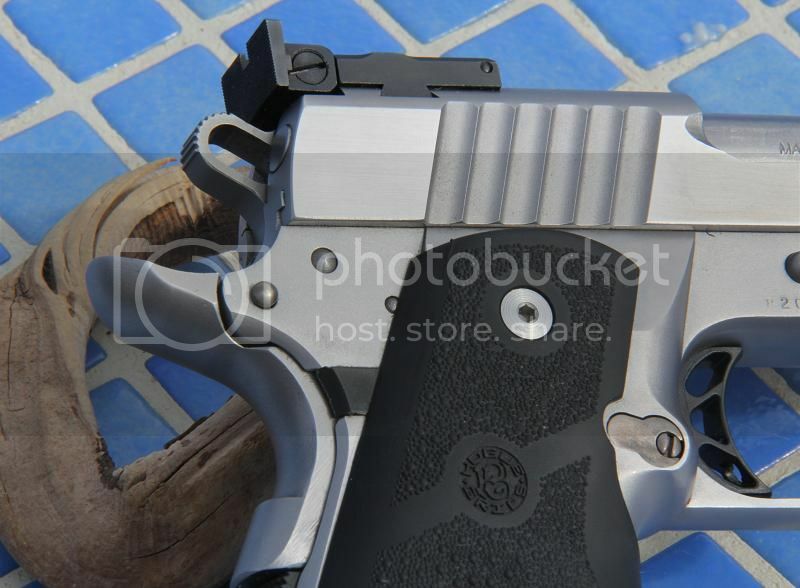 With a singlestack 1911, the crosspin would be directly over the same joint. Of course single stacks have the option of using even thinner panels, which is not the case for these Paras. A view from the rear, showing the panels' thickness and the 'ears' covering the trigger bow cuts. The sear pin is partially obscured, despite the cut for the thumb safety. Also note how the grip hugs the (integral) plunger tube. A small issue that only became apparent months after I installed these grips, is that the sear pin holes are partially obscured. The OEM Para grips also extend to the rear enough to do the same, but they have tiny relief cuts at these spots—not so with these grips. 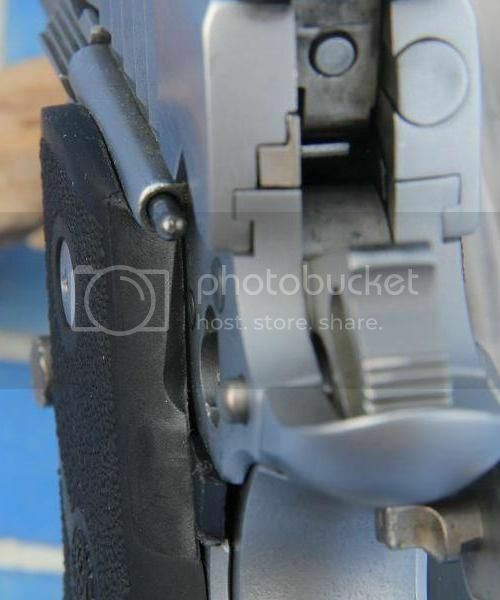 This means that to detail-strip your pistol’s frame, you need to remove the grips before you can remove the sear pin. 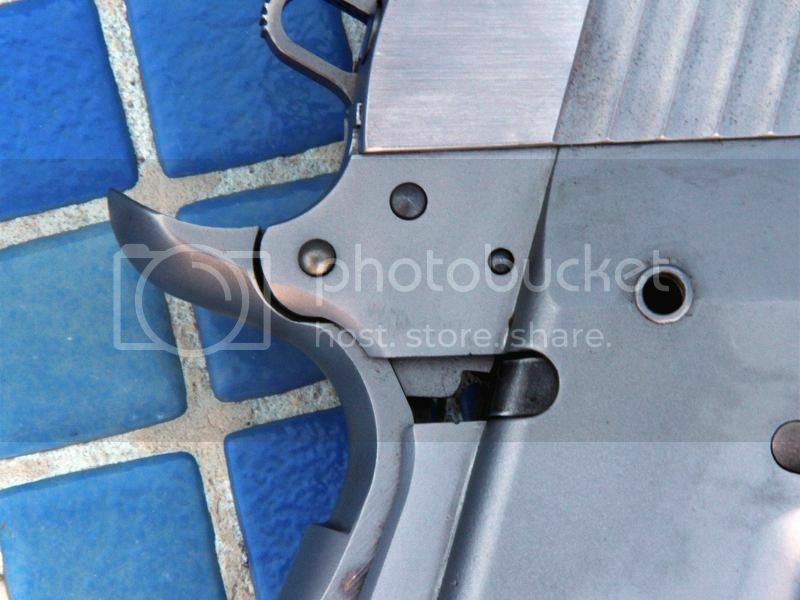 Obviously, removing the grips during a detail strip is necessary, to allow access to the trigger—so this is just a minor inconvenience, that I only noticed the third time I stripped down my frame. If it really bothers someone, making the appropriate cuts with a small circular file should be fairly straightforward. Incidentally, while I did not pay for these grips, I eventually bought a second pair. A friend who owns a similar Para, but in the much ‘snappier’ .40S&W caliber, was so impressed by mine that I got him a set, as a gift. Overall, I am very happy with these grips, as is my friend with his. They probably don’t belong on a concealed carry pistol, but if your Para serves mainly as a range and/or home-defense gun and your hands are big enough, these grips are well-worth considering. I would like to thank Mr. Phil Spielberger and the rest of the very accommodating ladies and gents in Hogue's 2011 SHOT Show booth, both for these grips and their hospitality. You may discuss this review in the M1911.ORG forum, here.